Cast : Jennifer Carpenter, Jay Hernandez, Columbus Short, Greg Germann, Steve Harris, Rade Sherbedgia. Synopsis: A group of people are unwittingly locked inside an apartment block when a mysterious viral infection takes hold. A camera crew riding with an attending Fire Crew film the events of the evening. Review : Solid, energetic and completely believable horror/thriller, using the Cloverfield/Blair Witch single-camera methodology, which works an absolute treat here. Quarantine is claustrophobic, tense and utterly compelling, a bravura film from the director of The Poughkeepsie Tapes and Dark Moon Rising. The examination of the human psyche when confronted with something intangible and unstoppable is well executed, with a genuinely moving performance from lead actress Carpenter. Cinema is often littered with the corpses of “event” films, with films made upon a single cliché or conceit that ignite the imagination briefly only to sputter and die out well after release. Modern “concept” cinema, such as Cloverfield and The Blair Witch Project, have made a healthy return on their respectively modest budgets, allowing independent and freelance film-makers to broaden their outlook as to what an audience is prepared to accept. Success breeds success, you might say. However, coming up with a new kind of interesting “concept” is the tricky bit. Not everybody wants to see a Blair Witch clone for the hundredth time. So how do you take the “found footage” genre and make it new and interesting? Simple. You dim the lights and add in the kind of super-fast creates we witnessed in 28 Days Later. Quarantine, another “found footage” film, successfully manages to straddle the fine line between eye-rolling cliché and absolute pitch-perfect film-making, ensuring it will remain a classic of the genre for many years to come. No, Helen Hunt’s Twister singlet was a lot less revealing than mine! The concept of the film in itself is pretty simple. A camera crew teams up with a local LA fire department to document a day/night in the life of those brave men and women who serve the country so well. When a call comes through to attend a disturbance at an apartment complex, little to they know that things are about to get a whole lot worse. Upon arrival, they encounter an old woman who appears to have contracted some kind of mental illness, before she attacks and bites one of the people also attending, a police officer. Before anybody knows what’s happening, the doors are locked and barred from the outside, effectively sealing the inhabitants (and rescue personnel) inside. While they all struggle to understand exactly why the Government would seal them in, the mysterious condition which has afflicted the old woman begins to spread to the rest of the group, until it becomes apparent that some kind of virus or disease is inhabiting the building. The afflicted become crazed, attacking with horrendous speed and ferocity, leaving the surviving members of the group no choice but to fight for their very survival with what few weapons they have: namely, anything they can pick up off the ground. No fava beans or chianti here…. Quarantine is based on the 2007 Spanish horror film REC, and according to the internet is a virtual shot-for-shot remake, with a few minor scene extensions and additions. Not having seen REC, I can only judge Quarantine on it’s merits. One can only wonder why the film-makers felt in a requirement to history to remake a film still so current; unless the budget and quality of REC was so bad that it screamed out for one, although considering the number of awards it was nominated for at the time of it’s release, I would assume that wasn’t the case. Still, Quarantine is a diabolically involving film, the clever use of focus, editing and production design helping to enhance the already incredibly tense premise and it’s outcome. The script, such as it is, is fairly loose in terms of strict dialogue requirements. While a fair amount of the dialogue was improvisational, the spartan style of the film’s premise allows for this, as panic and terror set in among those locked inside. This allows for the actors to really get into the moment, heightening their own terror, along with ours. Lead actress Jennifer Carpenter, whom many viewers will know as Deb from the hit TV show Dexter, as well as director Dowdle’s previous film The Exorcism Of Emily Rose, does a terrific job as Angela, a reporter for local news station who recognises the importance of recording the events that unfold, and along with her cameraman Scott (Steve Harris), allow us to follow the terrifying events of the film. Carpenter really goes to town on this role, and her acting chops later in the film are definitely tested during one of the most frightening, harrowing night vision sequences yet committed to film. Carpenter allows her most base emotions to boil up in a genuinely heartbreaking portrayal of a woman caught in a situation she’s utterly unprepared for. 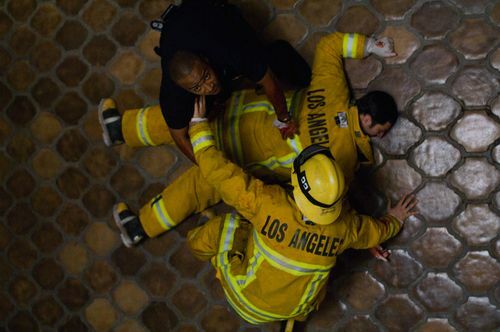 Jay Hernandez plays one of two fire-fighters caught up in this event, as Jake tries to keep things in control even when they’re so far out of it it’s beyond comprehension. Hernandez will be familiar to people for his roles in Friday Night Lights, the Hostel movies (ugh), and alongside Nic Cage in World Trade Center. Jake and Angela form a kind of friendly bond during the movie, with Angela increasingly dependent on the stoically brave fire-fighter for protection and support. The rest of the cast are also wonderful in their respective roles, both small and large, as the carnage unfolds. Greg Germann, who many will recognise from Ally MacBeal and Ned & Stacey, plays a veterinarian trying to save the lives of those both bitten, and pulverised, and not being able to do a great job at it. The ensemble works well, the screaming and incomprehensible cries of these people in dire need of help so well played by the cast it’s hard to remember at times that this is just a movie. Arnie hated the way Bazza used to fall down all the time…. The editing and narrative movement in this film is absolutely first rate. The film uses almost every trick in the book to cut between takes, from swipes and moments of blackness, to the Hitchcockian technique of moving the camera into people before pulling away again, revealing a different scene. It’s startling that they’ve managed to make this film look so genuine, like a real found footage tape, and a credit to the editing team that it comes together so seamlessly. Elliot Greenburg has managed to create a truly exciting and terrifying film in his editing suite. The production design on the apartment itself, where the captives live out their last moments, is very clever. Multiple levels accessed by stairs, dark corners and locked rooms, a puzzling maze of directions from which any attack could come, all serve to create the claustrophobic nature of the narrative; a pounding, pulsating journey into the dark corners of the mind. The lighting on this film is incredibly atmospheric, key lights and master lights all being required to exist simultaneously due to the single camera perspective not allowing any insert shots and alternate viewing angles. To say Quarantine is a scary film is to understate the real power of the piece. Quarantine is both terrifying and electrifying, a dazzlingly simple premise played out to nuanced perfection by both cast and production crew. Everything from the casting to the production design works so well in this film, it’s hard to criticize. If I can say anything negative on the film, it’s that it perhaps gets a little too cute with it’s shocking deaths and “zombie-mangling” methodology, and while often gruesome, isn’t far from the truth of life. I’d also say that at times, you want the camera to hold a bit more still, if only to really allow us to see key moments of the film and take it in properly; although, I guess that’s what the rewind and pause buttons are for, right? I was genuinely scared by Quarantine, and having seen my fair share of scary films, can safely say this ranks right up there alongside My Little Eye and Blair Witch Project for sheer terror. You don’t know what’s going on, and you find out along with the characters, through judicious use of dialogue: it’s this involuntary distribution of information, or lack of, that creates the tension in the film. Mrs Levinson and Jerry suddenly discover that the Wayans boys want to make another Scary Movie. Quarantine is not a film to watch alone (although I did), and there are numerous “jump” moments, so if you’ve a weak heart, I suggest viewing with the lights on for the sake of the paramedics who’ll have to come save you. Genuinely cool premise, alongside great acting performances and a terrifically atmospheric soundtrack (music free, with only the soundscape of the outside world to keep you company) make Quarantine one excellent thrill-ride of terror. Update!! – fernbyfilms.com goes Hi Definition! !